In every moment of your life where there is something of importance, it almost always involves dressing up and looking your best. Your first day at school, a first date, graduation, your first job, your wedding day, or maybe the first time you closed a big deal at work. Throughout all of these experiences you wanted to make sure you looked good. Why is that? Because when you look good, you feel good and you can be your best. When we clean your clothes: It’s right, it’s ready, or it’s free (so that you can be free and ready to do what’s right). 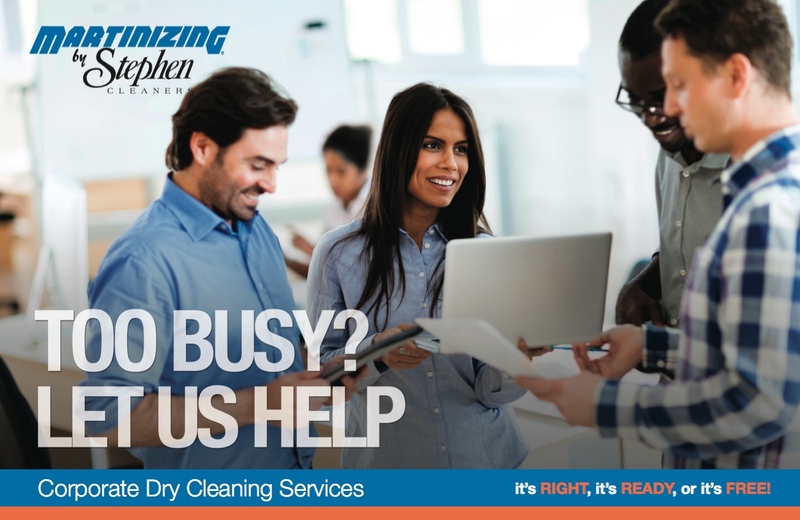 At Martinizing by Stephen Cleaners, we help you save time to do the things that matter the most. Martinizing by Stephen Cleaners is a Calgary-based, family owned and operated dry cleaning business. Since 1962, Martinizing has been committed to quality, community and the environment. We can make your garments look and feel like new again including dress shirts, suits, pants, blouses, skirts, curtains, blankets, jackets, purses, shining shoes, restoring Uggs and even more. We have become a Value-Added Partner with Hollyburn, giving residents an exclusive discount to access the best dry-cleaning experience on the market. We’ve been voted Calgary’s Best Dry Cleaner 9 times for the Consumer Choice Awards. Try our dry cleaning services and receive $20 off your first order (that could be equivalent to five shirts!) Our company also includes complimentary pick up & delivery to your work, as well as minor alterations. Now that’s customer service.